Cats are like lions and other predators, supposed to be living in jungles and getting the water required for their bodies from their prey. This fact leads us to think about the dry foods we buy for our cats; are they really nutritious or suitable for their bodies? Is it right to introduce my cats the dry food instead of the wet or homemade meals? In fact, the dry food is just an invention which was made by us...humans, to suit only us...humans. The dry food is suitable for our quick lifestyle and way of living; some may lack the time to prepare fresh meals for their cats, and some may also lack the knowledge about mixing the suitable ingredients with precise ratios for a healthy meal. All these factors have nothing to do with the cat’s body, and still the dry food is an unnatural solution that we may think is suitable and healthy for the pet. What the dry food does for the pet’s body is making it more difficult for the kidneys and liver to get rid of the body waste, in addition to the preserving compounds and artificial colors in these foods. The dry food is not a normal juicy meal; it is often toasted once or twice during processing. All these matters will certainly fasten the possibility of kidney failure, liver dysfunction and kidney stones formation. The fact that dry foods absorb much water makes them dangerous for many cats from several breeds. 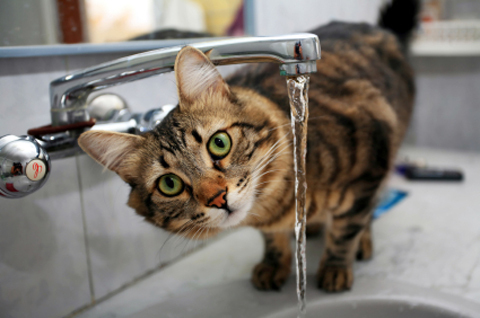 Cats are not usually water-loving animals, and some may not like to drink very often while others may tend to eat instead of drinking as they simply mix between the feel of hunger and thirst. The dehydration problem develops in summer, especially with long-haired species because their coats cause more sweat. So, the first thing you should do on daily basis is watching the time and amount of urine produced by your cats. Never get bored and know that this step is one of the easy medical care basics to ensure a healthy, long life. Any change in the cat’s urinary habits, such as the amount of urine or that your cat is not urinating regularly, could indicate dehydration or another very serious problem called “urinary retention”.